As part of the ArkType New Works Festival in April of 2018, and thanks to the McIlroy Family Visiting Professorship in the Performing and Visual Arts, the Department of Theatre in the J. William Fulbright College of Arts and Sciences is partnering with Theatre For One, a New York City-based theatre experience conceived by Tony Award-winning Broadway designer Christine Jones, whose upcoming credits include Harry Potter. 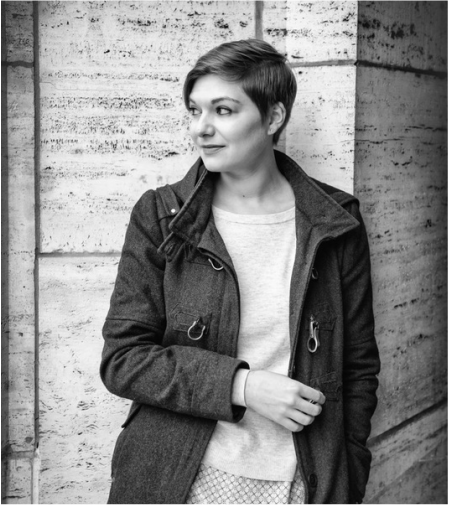 As a preliminary engagement with this exciting theatre company, Theatre For One is sending Emily Schwend, a veteran Theatre For One playwright, to teach master classes for writers interested in exploring how to develop short plays for this unique and intimate form. The master classes will be from 11 a.m. to 1 p.m. and 3:15-5:15 p.m. Thursday, Feb. 8. A few slots are available for each session, and interested parties should contact John Walch, head of the playwriting area, expressing their interest in attending. Theatre for One is a mobile state-of-the-art performance space for one actor and one audience member. Conceived by artistic director Christine Jones, Theatre for One commissions new micro plays created specifically for this venue's one-to-one relationship. Embracing serendipity and spontaneity, Theatre for One is presented in public spaces in which audience members are invited to engage in an intimate theatrical exchange and enter the theatre space not knowing what to expect. Actor and audience member encounter each other as strangers in this suspended space and through the course of the brief performance allow the divisions and distinctions that separate us to dissolve. In its review, The New York Times, says the brief theatrical "experience will last no longer than a few minutes but is likely to settle somewhere in your soul for a lot longer." Read full review. The Department of Theatre is bringing Theatre For One's unique theatrical experience to the University of Arkansas as a part of The ArkType New Works Festival (April 20-29), which will also feature full-length plays by graduate and faculty playwrights, as well as short-plays by undergraduate playwrights. In addition, the Department of Theatre will be micro-commissioning eight new works for the Theatre For One booth by a mixture of University of Arkansas Creative Writing and Theatre faculty and acclaimed American playwrights. These new works will be performed by Department of Theatre grad and undergrads in Theatre For One's mobile performance space in the Global Campus lobby during the ArkType New Works Festival. Complete information about the Theatre For One residency and performance dates and times will be available in mid-February, along with a full listing of events for the ArkType festival. About Emily Schwend: Emily Schwend's plays include Utility (The Amoralists, Yale Drama Series Award, IT Award for Outstanding Premiere Production of a Play, upcoming production at Orange Tree Theatre in London), The Other Thing (Second Stage Theatre Uptown), Take Me Back (Walkerspace), South of Settling (Steppenwolf's Next Up Rep), and Splinters (CUDC Source Festival). She was a 2016-2017 Radcliffe Institute Fellow at Harvard University and the inaugural 2014 Tow Foundation playwright-in-residence at Second Stage Theatre. She is a frequent contributor to Christine Jones's Theatre for One booth and a proud alumna of the playwriting programs at Juilliard and Tisch.